You think you're so funny, do you? 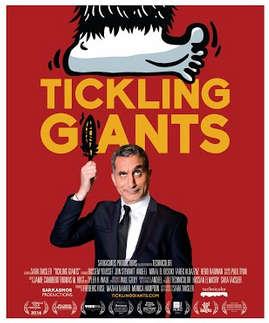 Well, to (allegedly) quote Her Majesty Queen Victoria, 'We are not amused', or at least I imagine that is the reaction current Egyptian head of state Abdel Fattah al-Sisi, who was clearly not amused by the antics of the subject of the documentary Tickling Giants. Dr. Bassem Youssef was the bane of two Egyptian Presidents, one who fell and one who rose. Tickling Giants chronicles Dr. Youssef's own rise and fall, a cautionary tale of how far to push satire among those pesky heads of state with thin skins. January 2011: Egypt is in the throws of the Arab Spring, when dictatorship upon dictatorship in the Arab world starts facing genuine opposition. Some Arab states, like Tunisia, managed to navigate a transition to democracy, or at least a version of it. Others, like Syria, drowned in blood when their dictator pushed back. And then there is Egypt. When the protests against the rule of longtime President Hosni Mubarak began, Bassem Youssef, a heart surgeon, went to the heart of the uprising, Cairo's Tahrir Square, to assist. Even in the midst of bloodshed and chaos, Dr. Youssef's witty comments and sarcasm could not be suppressed. He has a genuine love for comedy and holds up The Daily Show's former host Jon Stewart as his role model and idol. He soon starts posting his humorous takes on the news on YouTube, and the irreverent tone of his posts, along with his telegenic presence and outwardly ebullient manner, made him a hit among Egyptians. It was not long before he got the attention of Stewart himself, and Youssef's visit to The Daily Show was the ultimate in fanboy fantasy and mutual lovefest. With Youssef's continued success and popularity, he opts to become a full-time comedian and launches the show Al Bernameg, which in Arabic means 'The Show'. The winds of change are blowing across the Nile, as 30 million people watch Youssef's weekly program spoofing the official media and the Egyptian government. 30 million viewers weekly, versus Stewart's 2 million daily. The election of Mohammed Morsi from the Muslim Brotherhood to the Presidency of Egypt provides more fodder for Youssef and his Al Bernameg writers, who like him are young, irreverent Egyptians who think everything is good for a laugh. The growing dictatorial nature of Morsi's tenure proves irresistible to Youssef and Al Bernameg, culminating in an infamous opening where Youssef mocked Morsi's wardrobe and mangled English when the President was presented with an honorary degree. This proves one too many jokes for the government, which leads to charges against Youssef for 'insulting the President and Islam'. Popular mood is with Bassem Youssef, however, as Morsi's mixture of arrogance and incompetence gets him removed from office through a coup in all but name. The leader of said non-coup, General Sisi, is held in high regard by the population. They even make chocolate with Sisi's picture on them. Youssef believes things are going backwards in Egypt, but he also believes things should go on as they have been with Al Bernameg. For once, however, Youssef misreads the popular mood, as Sisi holds a lot of respect and admiration among the same people who watch Al Bernameg. In a case of 'when you're hot, you're hot, when you're not, you're not', Al Bernameg's constant satirizing of the news and the world now are not being as well-received. Youssef starts feeling the pressure, getting snappy and curt with his young staff, all of whom remain defiant in their writings on Egypt now. During one broadcast of Al Bernameg, the signal is lost (though apparently the commercials went uninterrupted). In three years, Youssef ruefully notes, Egypt has gone from getting rid of a military President to having a President more loyal to the military. It looks like democracy in Egypt took a sad side trip back from the future. With pressures all around, Youssef ends Al Barnameg and after losing a lawsuit by his former broadcaster, opts to leave Egypt for exile in America. It is clear that director Sarah Taksler loved Bassem Youssef''s sardonic wit and the whole concept of Al Bergnameg. Perhaps too much so, as Tickling Giants is, at nearly two hours, perhaps longer than it should be. It's also clear that Youssef's irreverent manner permeates throughout the telling of his story. Tickling Giants begins with a faux-disclaimer that adds among other things that 'using these techniques could lead to among other things loss of home, loss of friends, loss of constitutionally guaranteed rights, death...and vaginal dryness', adding that the film may not be suitable for all audiences. "If you are a dictator, please leave the room now", the film warns. Whether these bits display the type of flippant humor Youssef, Al Bernameg and Tickling Giants excelled at or diminishes the importance of the loss of freedom of speech and expression the film wants to chronicle is something left up to the viewer. Whether the Al Bernameg writers were defiant, naive, arrogant or unaware of the dangers of shifting popular moods too is something a viewer would have to decide for him/herself. At one point, when a 'mystery guest' was coming on Al Bernameg, one of the writers tells us, "At first I thought it was Morsi, but from the preparations I think it's somebody more important," and it looks like he is being perfectly straight. Another guesses that the 'mystery guest' is Justin Bieber, down to mimicking a faux-squeeing of a Bieber fan. Did they think in a country that has had no real democracy in its history, from the Pharaohs to Sisi, they could get away with such antics for long? Tickling Giants shows that Youssef is quite adept at finding the humor, though I agree with one non-fan who attended a Al Bernameg taping: he does swear too much. In almost all situations Youssef comes across as a clever, witty person: when talking to a volunteer at Tahrir Square mentioning all the various groups who've come to help, he quips "You should mention 'infidels' right after liberals". He even makes wisecracks when being interviewed: he tells us that he became a doctor to please his parents, and that with an engineer brother, if they'd had a third brother who'd been a dentist, they could almost be a Jewish family. Youssef aimed to be the Court Jester of Egypt: it should be remembered that in medieval courts, the jester could speak truth to power in the guise of jokes. He could tell the truth by showing the ridiculous nature of news coverage and the figure's own words (as he observers early in Tickling Giants, there was the reality he saw and the reality he saw on TV). He felt the need to tackle that and bring the truth, with jokes, to his fellow citizens. As a side note, I'd argue that Youssef was better than his idol; he took on any side that was in power, while Stewart, along with his successor Trevor Noah and the various American late-night shows (Colbert, Kimmel, Meyer, Saturday Night Live) tend to be all one-sided. We learn what happened after Youssef was essentially forced into exile: some of his writers continue to plug away for their right of dissent, even becoming writers on the Arabic version of Saturday Night Live (begging the question, 'there's an Arabic version of Saturday Night Live'?). Tickling Giants doesn't overtly talk about the issue it revolves around: freedom of dissent and the suppression of it. It also does not explain how a population that seemingly embraced Bassem Youssef could quickly turn against him. While I don't think the filmmakers cared about why Youssef fell among the people (it's easy to know why he fell from Arab television), you can guess that they were manipulated by the same media Youssef and the Al Bernameg staff were spoofing. Minor points, and the length is an issue, but Tickling Giants makes a strong case on the importance of free thought and expression, how a nation that is not free to laugh at its leaders is a nation that fails to be free.